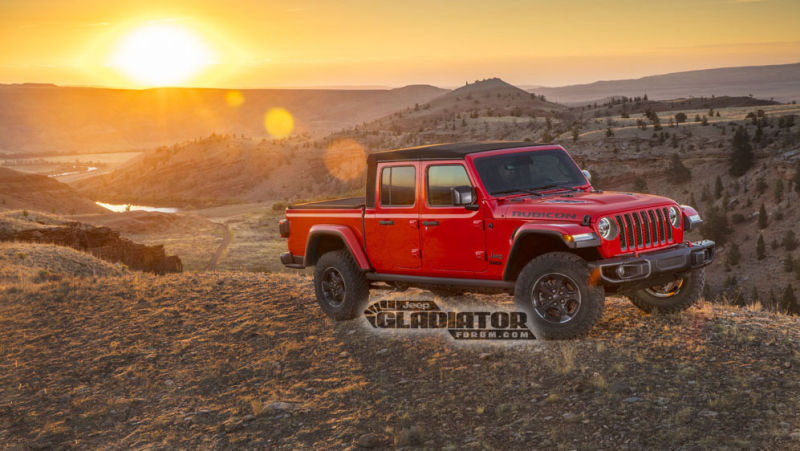 Well ladies and gentlemen, the long-awaited imagery of the Jeep JL truck is here, and it’s bearing the name of Brute Double Cab, I mean Gladiator. 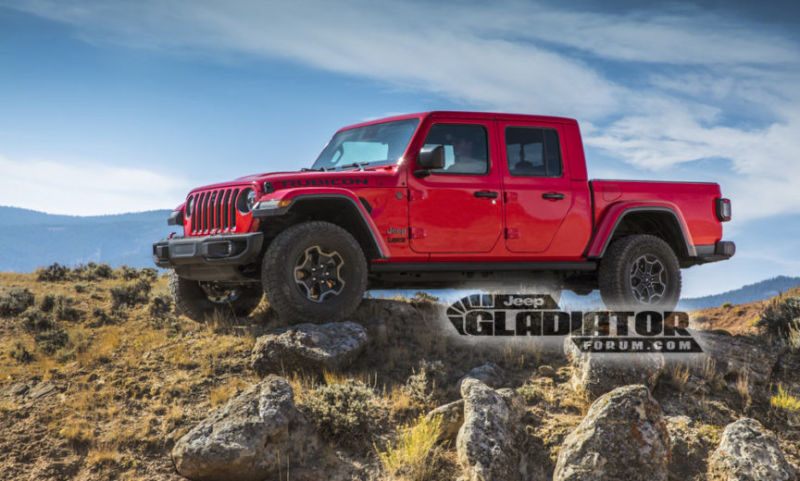 Although these weren’t officially released by FCA, leaked press photos of the new truck were found and subsequently posted by Gladiator Forums earlier today. Here’s what we know so far. First of all, the truck looks just about identical to what we all hoped it would be. A simple, rugged, boxy JL truck packed with off-road goodness. 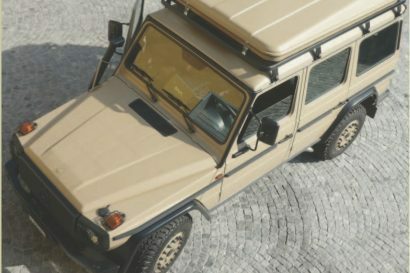 Photos show both a soft top and a hard top, as well as a Rubicon and what appears to be a Sahara trim. 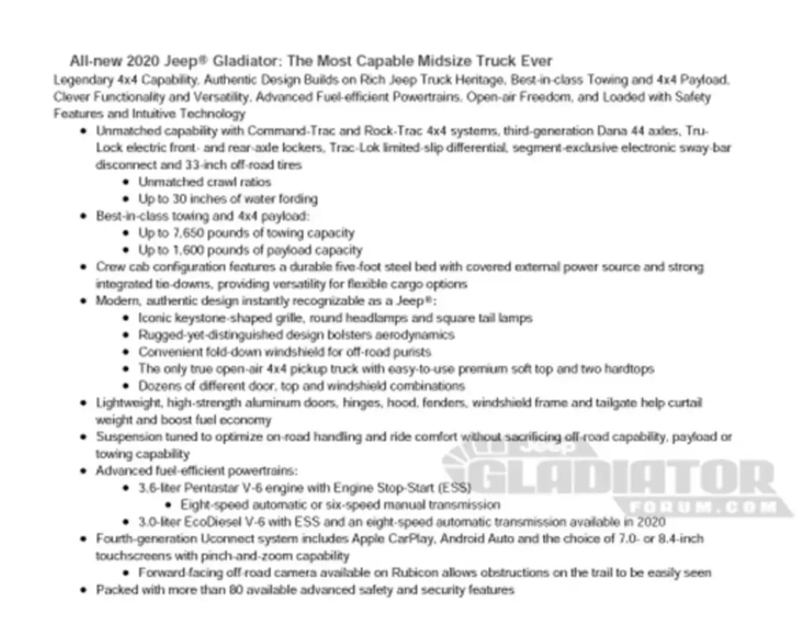 Another screenshot posted later on the forums, which we’ve included below, indicates that the truck will have a 3.6L V6 as standard, with the optional 3.0 liter EcoDiesel we all hoped for and, to be honest, sort of expected. We’re also seeing a towing capacity of 7,650 pounds, a 1,600-pound payload, and up to 30 inches of water-fording capability. 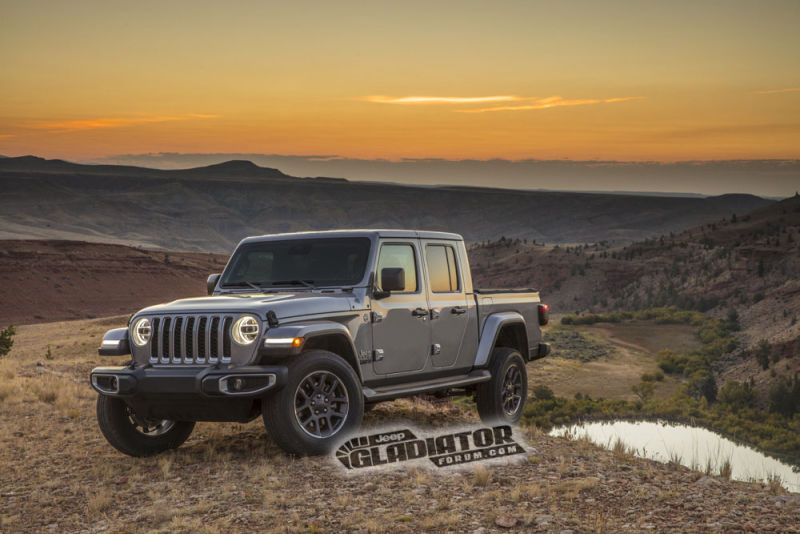 All of the usual Jeep goodies like Dana 44 axles, a fold-down windshield, door, top, and windshield options, as well as electronic lockers, sway bar disconnects, and 33-inch tires will be available. Transmissions will come in two flavors, either a six-speed manual or an eight-speed automatic. Interestingly, it notes “crew-cab configuration” specifically, so it’s possible that alternative formats may come later. We could certainly get behind that. 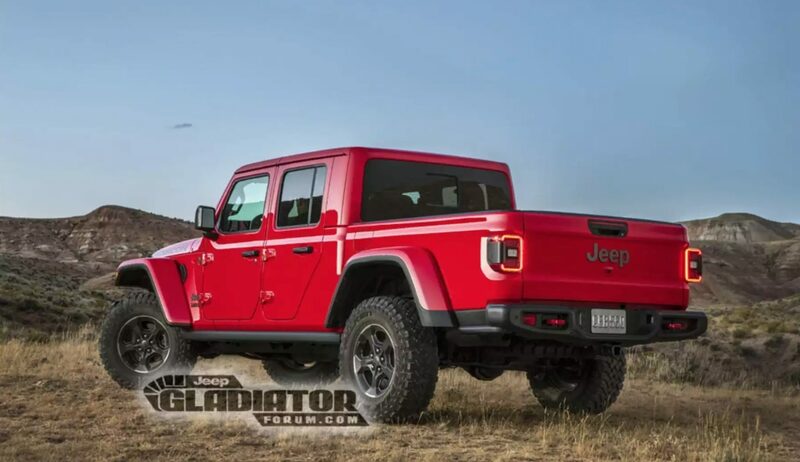 Although no official response has been posted by Jeep or FCA so far, we hope that one will come out soon. We will update you as more information becomes available! 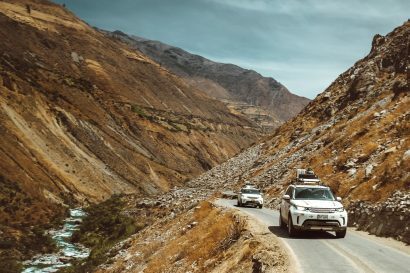 The overlanding potential on this thing is limitless. The room for both water and fuel tanks underneath. The ability to carry any type of camper concept, even full bed replacements. The possibilities truly spur the creative mind. 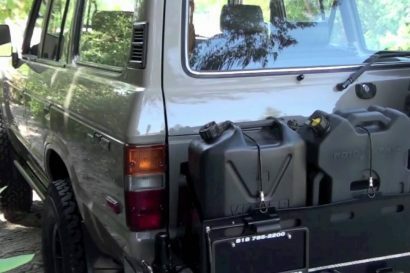 Been my experience that all Jeeps leak. Sorry, I’ll see myself out….